Habitually, iPhone and iPad users forgot restrictions passcode iOS 11, iOS 10, iOS 9 or iOS 8 due to failed attempt or reuse after a long time. Apple doesn’t give an option for recover or reset restriction passcode officially like other recovery option available on online Mail or Social login. Without restriction passcode we didn’t make any changes like sync to iTunes, Changes on selected apps settings, limitation on App store, install or delete apps, other services by apple. Lock App on iPhone, iPad individually. Note: passcode and restriction passcode is different, but both have the same code. We can open passcode on lock screen through Touch ID as an alternate option. But for restriction passcode, you don’t have any option in the case for if you are forgotten. In this case, you need more steps to recover forgot restriction passcode through editing some lines of code into the file through software. Step 1: connect your iPhone, iPad or iPod Touch to Mac or PC via lighting cable. Launch iTunes, ahead you can see your iOS device in iTunes and Click on that, From the summary page start a current backup of the apparatus. iTunes will save all backup files on local system directory. Step 2: Download and install ibackup bot for taking backup all file and add the restriction code inside file through this software. 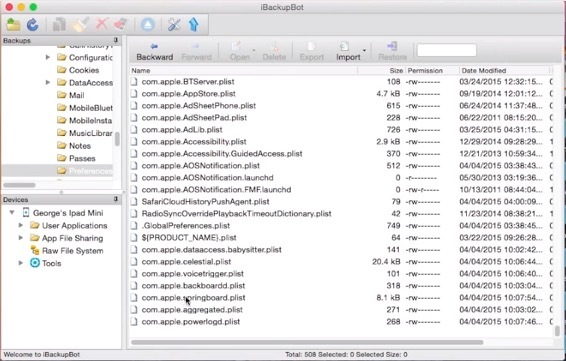 Launch iBackup bot on Mac/ PC. Now this will detect all back saved in the system automatically. Step 3: From the iBackup Bot side panel’s folder directory, Choose your device name (iPhone, iPad or iPod whatever). Step 4: Click on it, Goto SystemFiles/homeodomain/Library/Preferences. Under the Preferences folder, find a file named with “com.apple.springboard.plist“. Double click on it for open. Choose cancel on a new popup. Add below 2 lines of code just after </dict> tag. Step 5: Now you have to restore this changes made in this file directly to iPhone, iPad or iPod Touch through iBackupBot. Now tap on restore from top tab. on your iPhone go to General > Settings > Restrictions > Type 1234 in passcode. Above steps works with iOS 10, iOS 9, iOS 11 running on iPhone x, iPhone 8, iPhone 8 Plus, iPhone 7/ 7 Plus, iPhone 6/ 6+, iPhone 5S/ SE, iPhone 6S/ 6S+, iPad Air, iPad Mini, iPad pro, iPhone touch all generations. Best of luck, enjoy. Now you can change settings based on restriction again without restoring old iOS backup to iDevice. Thanks to iBackup Bot that will perfectly help on change or reset forgot restrictions passcode iOS 11/ iOS 10/ iOS 9 devices (iPhone, iPad or iPod Touch).